While Indian leaders and strategists claim a pre-eminent role in the Indian Ocean Region and portray the Indian Navy as the key guarantor of security in these waters, it remains unclear whether the hard power capability exists for discharging such a role. With the navy’s annual budget steadily declining, national security planners are reluctant to green light crucial power projection platforms, notably India’s second indigenous aircraft carrier (IAC-2), which should have already been under construction to join the fleet by about 2030. Yet, the National Democratic Alliance (NDA) government, like the United Progressive Alliance (UPA) government before it, continues de-prioritising the navy in allocating financial resources. The navy’s budget, instead of growing to support the heavily tom-tommed “Act East” strategy, is currently at a decadal low. Since 2010-11, when the navy got 30 per cent of the three services’ capital budget, its allocation has dropped to 25 per cent this year. As a percentage of the military budget, the navy’s share has fallen from 19 per cent in 2010-11 to just 15.5 per cent this year. The absolute figures are even more telling. Were the naval allocations to have risen seven per cent annually since 2010-11, roughly in tandem with the Gross Domestic Product (GDP), the navy’s capital allocation of Rs 17,140 crore (Rs 171.40 billion) in 2010-11 would have grown to Rs 29,451 crore (Rs 294.51 billion) this year. In reality, the navy got just Rs 20,848 crore (Rs 208.48 billion). Nor is there recognition of the ten per cent annual inflation in defence, or of India’s “Look East” and “Act East” policies that call for stepping up the navy’s budget. The reduction in naval allocations comes despite the defence ministry’s official approval of the navy’s Maritime Capability Perspective Plan. First drawn up in 2005, and updated for the 15-year period 2012-2027, this committed to fielding three aircraft carriers, so that at least two are operational at all times, one each with the western and eastern naval fleets. “The ministry is reneging on a solemn commitment”, says Admiral Arun Prakash (Retired), who was naval chief in 2005. While inadequate capital allocations affect all warship acquisitions, the drag is most apparent in the navy’s flagship project to design and develop IAC-2, which will reportedly be named INS Vishal. The first indigenous carrier, INS Vikrant, which is being constructed in Cochin Shipyard, is expected to be commissioned in 2021. IAC-2 should have begun construction, but has not even managed to get an “in principle” approval from the defence ministry, which seems paralysed by the fratricidal contest between the army, air force and navy for the same depleted budget. The air force, seeking to canalise the budget to new fighter squadrons, has argued that the aircraft carrier is an outdated concept, and that land-based fighters, with their ranges extended by mid-air refulling, can strike targets far out to sea, without the risk that aircraft carriers run of being sunk by anti-ship missiles, torpedoes, or “carrier killer” ballistic missiles like China’s Dong Feng–21D, which China claims can destroy enemy carriers 1,500 kilometres away. Like predictions about the death of the battle tank, the hobbyhorse that aircraft carriers are anachronous has been conclusively rebutted, not least by the US Navy, which continues basing its power projection on the “carrier battle group”. To be sure, aerial refuelling allows shore-based fighters to strike targets at greater ranges. The plan to station fighters on island bases – like that “unsinkable aircraft carrier”, the Andaman and Nicobar Islands – adds weight to the air force’s argument. But shore-based fighters must return to base after striking a far-away target or risk running out of fuel. They have no “persistence” over areas hundreds of kilometres from their shore bases. In contrast, an aircraft carrier, escorted by a flotilla of multi-role destroyers and frigates, anti-submarine warfare corvettes, a submarine or two and a range of airborne assets, can project power and dominate areas thousands of kilometres out to sea, where shore based fighters cannot reach even with refuelling. INS Vishal will be India’s first real “power projection” aircraft carrier. None of the navy’s earlier carriers – the original 16,000 tonne INS Vikrant and the 24,000 tonne INS Virat, both decommissioned now, or even the 45,000 tonne INS Vikramaditya, which is currently in service, or the new 40,000 tonne INS Vikrant – can embark more than about 30 aircraft. That is insufficient for the dual task of protecting the “battle group” and also dominating the seas around. In contrast, INS Vishal, a 65,000 tonne giant, will embark 54 aircraft, including fighters, electronic warfare aircraft, airborne command posts and anti-submarine helicopters. While less versatile than the US Navy’s 100,000 tonne supercarriers, the Vishal, along with another ten-odd helicopters based on its accompanying warships, can both protect and dominate. Senior defence officers have described to Business Standard the economics of an indigenous, conventionally powered IAC-2 – since nuclear propulsion was ruled out after Bhabha Atomic Research Centre (BARC) said it would take 15-20 years to develop a nuclear reactor large enough for a carrier. The cost of building such a carrier at Cochin Shipyard is estimated at Rs 40,000 crore (Rs 400 billion). Another Rs 40-50,000 crore (Rs 400-500 billion) would be needed for a carrier aviation wing – the aircraft it will embark. 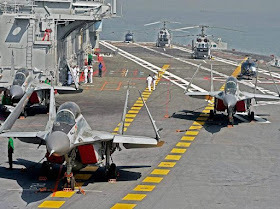 While the navy will operate three carriers once INS Vishal joins Vikramaditya and Vikrant, senior naval planners say two “aviation wings” will suffice since the need to refit one of the carriers, turn by turn, would leave two operational at any time. Two air wings, therefore, would rotate between three aircraft carriers. Since India already has 45 Russian MiG-29K/KUB fighters, mostly based on the Vikramaditya, the navy has initiated the purchase of anther 57 “multi-role carrier-borne fighters (MRCBF) for its second air wing. In this procurement, which began in January 2017, Boeing’s F/A-18E/F will compete with Dassault’s Rafale-Marine, Saab’s Sea Gripen and the MiG-29K. The navy’s IAC-2 programme, therefore, requires Rs 80,000-90,000 crore (Rs 800-900 billion), spread over 15 years, or some Rs 6,000 crore (Rs 60 billion) annually. Were the defence ministry to revert to the funding percentages of 2010-11, allocating 30 per cent to the navy, its capital budget could cater for that annual outflow. “It is ironic that the budget of the navy – the service that builds its weapons platforms primarily in India – is being gradually cut. Meanwhile, the budgets of services that mainly buy from abroad are increasing. So much for ‘Make in India’,” says a defence ministry official ruefully. While the ministry dithers over sanctioning IAC-2, a US-India joint working group (JWG), set up in January 2015, is working with the US navy and warship industry -- acknowledged as the gold standard in aircraft carrier operations. Consequently, the navy is embracing American design and operating philosophies, such as catapult launch of aircraft. The Pentagon has agreed to provide India with EMALS – the “electro-magnetic rail gun aircraft launch system” – a system so advanced that only the latest US Navy carrier has it. The remaining US carriers still launch aircraft using the conventional “steam catapult”. Meanwhile navy sources say the Pentagon has agreed to reserve vacancies for Indian aircraft carrier designers in US Navy design courses. Indian navy officers describe as “an eye opener”, their exposure to US Navy operating procedures. 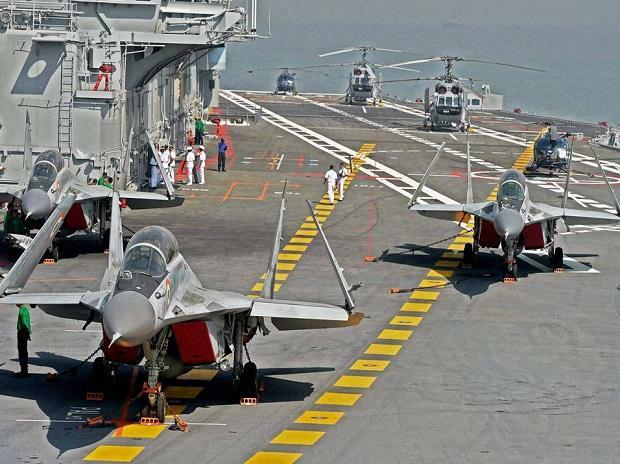 They are learning from their US counterparts new methodologies for final operational trials on new carriers, which will cut down time for operationalising the Vikrant and Vishal. All this, however, awaits the defence ministry’s grant of “Acceptance of Necessity”, which will open the doors for the IAC-2 project to start. However, there is no telling when that green signal will be given. India’s grand strategy seems clear about its maritime component. But operationalising that maritime strategy continues to be held up by hesitant and wavering decision makers. Ajai is toeing the US line. More than INS Vishal the necessities of the day are more submarines and anti submarine helicopters. Thankfully the recent Govt to Govt deal on MH60R happened but it should have happened long back. It also bring forth the point that often large scale defence acquisition are financed outside the budget. While the political class indulges themselves with the idea of building a blue water Navy, the unfortunate reality is that they are unable to execute their MCPP made in 2005. The fact remains that IAC 2, MCMV's, P75 India, LPD's, ASW's are all delayed or in a limbo. The MoD still refuses to encourage Make in India or private participation - both important factors when it comes to decreasing costs and building capabilities in country. Actually, it's the Indian Navy line that I'm toeing. You, on the other hand, are toeing a submariner's line. As for large scale defence acquisitions being "financed outside the budget", do give us an example. I've never known this to happen. We need to get our basics first. Let us get helicopters for our existing fleet (NMRH & NUH), get anti mining boats up & running, reduce time to build warships. Then comes what escorts dies this giant AC need ? Make them . Later induct the IAC-2. We also need to learn from China to expand at lower cost. Just repeat the design of the ship IAC-1, it will be cheaper faster , rather having grand day dreams. This will be much cheaper and existing 45 MiG will suffice. By the way even our IAC-1 seems to be taking forever to launch. Thankfully BARC told the truth about design time for reactor, not promise one in a few months. Great guys. Need to appauld them on their honesty.